Causes for fckstyles.xml to not be processed? I'm trying to customize the styles drop down and fckstyles.xml doesn't seem to be getting processed, at all -- none of the defintions in there, not even the demo ones, are showing up. I've tried putting it in different places, and editing path in the config file, and none of it seems to make a difference. Add'l info: I've verified using Firebug that fckstyles.xml is being successfully retrieved. Re: Causes for fckstyles.xml to not be processed? Any clues on where I should be looking to resolve this issue? Is anything at all showing in your styles drop-down? Can you post a demo link? Can you post the entire of your fckstyles.xml here so I can check for errors? ..If it's being retrieved but no styles are showing up, then it's either invalid XML, or some attribute is set that FCKeditor doesn't like. Try the W3C.org xml validator to check for any syntax errors. Other than that, I don't think anyone can help you unless you actually post the file here. The styles drop-down is populated. According to the documentation in fckstyles.xml, that's as expected, since the core styles are hard-coded. I'll attach a screen-shot. Here's the fckstyles.xml file I'm trying to load. The stuff I've added is at the end. However, none of the stuff at the beginning will show up either -- that's the demo stuff, that's there by default. If I understand the code documentation properly, it should. * See FCKConfig.StylesXmlPath in the configuration file. # needed here by default. # These are core styles available as toolbar buttons. Screen shots are from FF3 in OS X, but they look the same in IE7 on Windows XP. 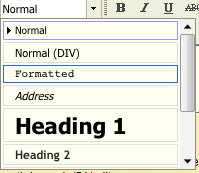 The cursor is placed within a paragraph container for this screenshot. This is the dev site for a client and I'm on a tight deadline, so I can't easily send a demo link. But I can provide any Firebug output that's useful, if you tell me what you want to see. Someone on Drupal.org cleared this up for me. 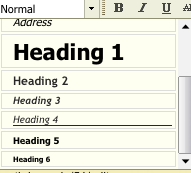 It seems that the combo I was looking at, with all those semantic block-level elements in it, is actually the "Font format" combo, not the style combo. Once I deleted the "Font format" combo from the config file and added the "style" combo, all was well.